Meet our library mascot (or would that be mascat?). Ben was a Beanish-Type Baby in a former life, but now he lives in our library by the circ desk and all our students visit him once a week. This summer, several of our teachers will be taking Ben (or one of his litter-mates, purchased on Ebay in the last few days) with them on vacation. Ben will be visiting South Dakota, Central Texas, Upstate New York, Alaska, Victoria, British Columbia, Paris, Dublin, Kazakhstan, Germany, Austria, Mexico, Hawaii and many more exciting places around the world! Traveling companions will be taking pictures of Ben in many culturally interesting places, near recognizable sights as well as in more hard-to-guess settings. Next year, students at our school will have a chance to guess where Ben traveled during his summer vacation! Hopefully this will spark some student (and teacher) interest in using our online databases for research. Google Earth, a newly discovered and well-loved tool in my building, will fit nicely into the activity too! 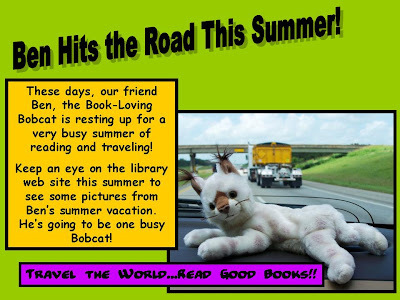 This project ties in with the project described in my previous post, in that for the second year, our library theme will be Travel the World…Read Good Books! This theme is shared by our wonderful counselor, and we plan all sorts of fun and hopefully meaningful activities for our K-5th graders next year to encourage an appreciation for diverse cultures around the world. Would that the district might let us collaborate in a meaningful way with actual people in other countries through wikis, collaborative projects, streaming video, etc. Change is slow…baby steps…must keep reminding myself. We may be able to get some epals set up or something of the sort, if we are lucky! That would be a step in the right direction! Exciting days for Ben!